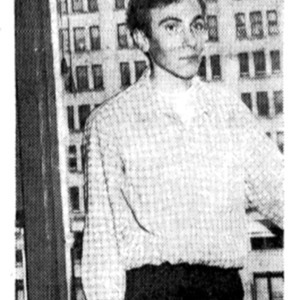 This is a photo of NYU CORE chairman Gerald 'Jerry" Bornstein taken from a 1965 copy of NYU's student newspaper. Professor Bornstein later became the Deputy Chief Librarian at Baruch College and was the author of several book, such as 'The Wall Came Tumbling Down: The Berlin Wall and the Fall of Communism' . “photo of NYU CORE chairman Jerry Bornstein ,” corenyc.org, accessed April 18, 2019, http://www.corenyc.org/omeka/items/show/242.